A modern woman facing breast cancer and mastectomy is forced to confront issues in her life that may have contributed to her illness. An Iron Age Scythian girl competes in the desert arena and goes to war against Theseus and his Greek armies to preserve the freedom of her Amazon tribe. 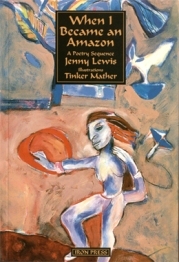 In this powerful and moving epic poem, Jenny Lewis explores the lives of two women fighting for the survival and the energies that link them across the centuries.